Making Water Fit to Drink - With Tree Seeds! Home > Case Studies > Making Water Fit to Drink - With Tree Seeds! In Britain, we tend to be pretty blasé about our water. Turn on the tap and there it is – and what a fuss we make if the water companies tell us to stop using our hosepipes when reservoir levels run low – but as we all know, for the rest of the world, however, it’s often a different story. According to Water Aid, one in six of the world’s population – that’s approaching 900 million people – live their lives without regular access to a supply of clean water and an incredible 80 per cent of illnesses in developing countries result from water borne disease. The United Nations has estimated that at any one time, around half of the patients occupying the world’s hospital beds are there because they are suffering from one form or another of disease linked to bad water. 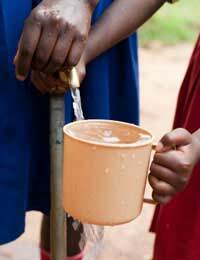 In many areas of Africa, Asia and Latin America, untreated surface water is the only source for the majority of the inhabitants – particularly the poorest – and around two million of them – mostly children under five - will die each year from drinking the contaminated supply. It is a gruesome set of statistics, but now an incredibly simple and cheap method to purify water, based – almost unbelievably – on tree seeds, might just be about to change all of that. It is something that he believes could go a long way towards solving the water purification needs of many impoverished settlements around the world. The idea behind the technique is very straightforward, relying on the remarkable natural properties of the Moringa seeds themselves and calling for little more in the way of equipment than a means to crush them. Biotechnology seldom comes much simpler than this! The powder from crushed Moringa seeds is mixed with water to form a suspension, which makes a very effective natural clarifier, capable of purifying turbid, pathogen-infested surface water to a level which makes it cleaner and much more suited for human consumption. It is also said to make the water taste better. In tests this procedure has achieved reductions of between 90 and 99.99 per cent in the numbers of bacteria present in untreated water, making it a major potential life-saver, especially in the context of the illness and mortality figures given earlier. Lea concedes that this “does not represent a total solution to the threat of waterborne disease”, but points to both the significant advance that it does make and the economic benefits that greater cultivation of this important plant could additionally bring. To help bolster the uptake of this technique, the details of the procedure have been made freely available as a down load under the access programmes of the John Wiley & Sons’ Corporate Citizenship Initiative. With luck, it might just help spark the beginning of a public health revolution in the developing world. One thing’s for sure, with so many lives lost for the simple want of clean water, it’s about time! This type of treeneeds to be introducedin our rural areas. The financial insitutions like TheWorld Bank could promotethis technology as oneaspectof RuralWaterSupply and Sanitation Project.